What’s that squeak? That rustle of wings? That shadow moving across the ceiling? Here’s how to get bats out of your house. Bats are one of the most common home invaders around the world, and while they’re usually harmless, they’re certainly not welcome, and for good reason. When bats roost in homes – usually in attics and other dry, warm places – they create a mess of droppings and pee that emits an unpleasant aroma. And if they manage to get into the living area of a home, there’s a concern that they could carry rabies, a viral disease that can be transmitted to humans through a bite. So if you do find a bat – or several – in your home, what’s the best plan of action? Just this year, Midcoast Wildlife Specialists has removed bats from about 150 homes throughout the state of Maine, with the typical eviction costing between $1,200 and $1,500, and an additional cost for any clean up or repairs. Bat infestations can be messy, and unsanitary. But before any clean up can be done, the bats have to be excluded from the building – for good. To evict the bats, Midcoast Wildlife Specialists locates where the bats are entering the house. They then create a one-way door over the entry point. This simple contraption opens outward, allowing the bats out of the house, but not back in. They then wait for the bats to fly out for their nightly hunt. However, Steeves and his associates prefer to only remove bats from buildings during certain times of year, when the animals are most likely to survive the ordeal. In Maine, they usually won’t evict bats when they’re raising pups in late spring and early summer or while they’re hibernating in late fall and the winter. But sometimes, they will make an exception. Bats play an important role in the ecosystem around the world by consuming vast quantities of insects, pollinating plants and dispersing seeds. And of the more than 1,300 species of bats living worldwide, many species are endangered or threatened. Therefore, it’s a good idea to consult a local wildlife specialist such as a game warden before taking bat-related matters into your own hands. If you do decide to remove bats from your home without the help of professional services, a great resource to learning more about this is Bat Conservation International, a worldwide organization dedicated to the protection of all bat species and the goal of “creating a world in which bats and humans successfully coexist.” On the organization’s website, batcon.org, there are detailed instructions on how to build a bat exclusion device out of a PVC pipe that acts as a one-way door. Hutchins said that bats often enter a home through the eves or gables, and that they can work their way through broken vents and screens. Often they’ll leave behind grayish “scuff marks” where their body oils rub off as they squeeze through the narrow space. When a bat starts to roost in a house, the main concern, Hutchins said, is the mess and odor they cause, but there’s also a concern about bats carrying and transmitting rabies. Most bats don’t have rabies. For example, among bats submitted for rabies testing because they could be captured, only about 6 percent had rabies, according to the United States Centers for Disease Control and Prevention. 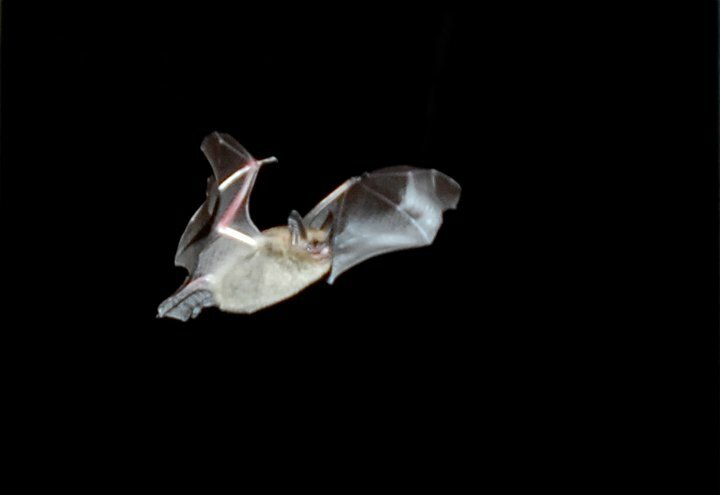 Nevertheless, bats are the most common source of human rabies in the US. Among the 19 naturally acquired cases of rabies in humans in the country from 1997 to 2006, 17 were associated with bats. Among these, 14 patients had known encounters with bats. Four people awoke because a bat landed on them and one person awoke because a bat bit him. In these cases, the bat was inside the home. Rabies is transmitted to humans through the saliva of infected animals. Therefore, it’s important that anyone dealing with bats wear gloves. Though if you use an exclusion device to remove the bats, you won’t need to come in contact with them at all. “You also could put up a bat house beforehand, and then maybe they’ll move to the bat house rather than another part of your house or the neighbors,” Hutchins said. However, in cold climates, bat houses are not warm enough dwellings for bats during the winter. If you can, it’s best to wait until spring.